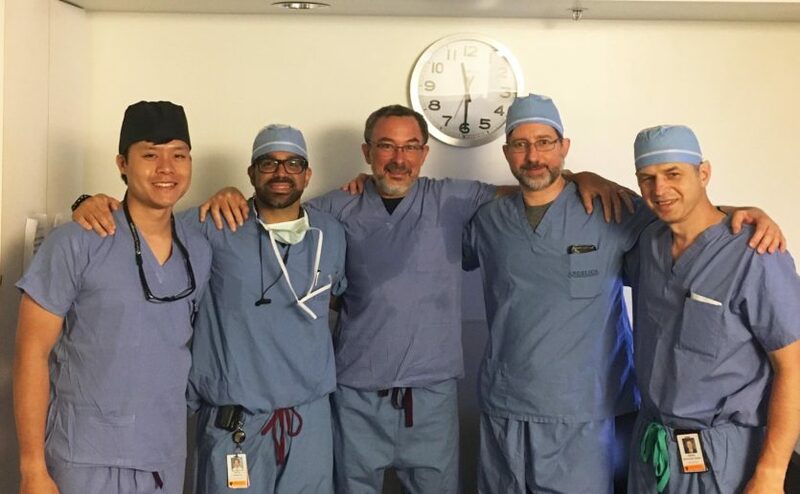 The Mass General team involved in the recent mitral valve replacement procedure included, from left, Michael Young, MD; Gaston Cudemus, MD; Ignacio Inglessis-Azuaje, MD; Jonathan Passeri, MD; and Serguei Melnitchouk, MD. A team of Massachusetts General Hospital physicians recently became the first in New England to perform mitral valve replacement with a new, minimally-invasive method that doesn't require patients to undergo a full open-heart procedure. Physicians at Massachusetts General Hospital’s Corrigan Minehan Heart Center recently marked a significant milestone by becoming the first team in New England to perform a transcatheter mitral valve replacement in a non-calcified mitral valve, a minimally-invasive procedure for patients with mitral valve regurgitation. The disease – which can cause patients to feel symptoms like shortness of breath and fatigue – occurs when blood flows back through the diseased valve to the atrium of the heart. Statistics show 1 in 5 patients age 70 and older are affected by this condition and, if left untreated, it can lead to heart failure. Traditionally, patients receive replacement valves through open-heart surgery. The procedure is performed by making a small incision between the ribs, inserting a catheter through the bottom of the left ventricle into the mitral position. The team – comprised of an interventional cardiologist, a cardiac surgeon, an echocardiographer and an anesthesia specialist – then inserts the replacement valve. The operation can be completed in less than an hour compared with traditional open-heart surgery which may take several hours. The Mass General procedure is part of the APOLLO trial, a national study to analyze the effectiveness of the new synthetic valve administered via catheter versus open-heart surgery. Participants for the trial are adults experiencing moderate to severe mitral valve regurgitation who are candidates for traditional valve replacement. “The pace at which this field is accelerating is exciting for us and hopeful for patients,” says Serguei Melnitchouk, MD, cardiac surgeon, co-director of the Heart Valve Program and co-principal investigator of the trial. While the procedure is a notable event in the treatment of heart valve disease, it is not the first time the Mass General Heart Valve Program has made history. Ten years and one day before this procedure, a team of Mass General specialists were the first in New England to perform a transcatheter aortic valve replacement. For more information on how you can support the Corrigan Minehan Heart Center, please contact us. This article first appeared in MGH Hotline. Your gift can help spark innovation, accelerate discovery and save lives.